The sway bars are a crucial part of a car’s suspension because without them your car’s handling would be bad. 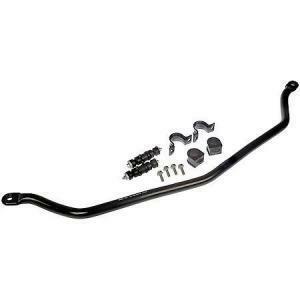 When you are faced with unfavourable situations while driving, the sway bars help your car stabilize. Without them, your car could go out of control in an instant, which is why maintaining the health of sway bars is necessary. Sway bars are rods made of iron or steel, so they cannot snap easily, but keep in mind that the front suspension of an engine comes under immense stress, so it is not unlikely for a sway bar to wear out. When a sway bar does wear out, it can either have a small effect on your daily drive or it can completely obliterate your car’s stability. Therefore, it is best to know the signs of a failing sway bar beforehand. The sway bar has rubber bushings on its two ends where the bar links to other suspension parts. The biggest issue with a sway bar is its deteriorating bushings. These bushings are made of rubber, a material that is easily compromised once it comes under stress. Most of the time, simply replacing the bushings can solve your suspension woes. However, it is better to know when to change them rather than wondering when they will fail. As mentioned before, the bushings are the root cause of sway bar failure. When bushings deteriorate they start to make a rattling noise which can be heard if you dive over a speed bump. In extreme cases, the clatter can be heard on straight stretches of road. When this happens, you should immediately visit the mechanic for a checkup. When the sway bar links are loose the tires lose their grip and your ride handling is affected. The first signs will be felt in the steering wheel where you won’t be able to turn your car effectively. Again, the guilty party over her are the bushings, which can wear out under extreme stress. Furthermore, rust or dirt can also cause the handling to deteriorate. A failing sway bar will reduce stability and traction in your wheels. Not only will you feel your car is extremely out of control but you will also feel it is falling apart right at this moment. This feeling comes to the steering wheel while you drive and that’s the best part about suspension parts, they can be inspected without you ever looking at them visually. The sway bar should be cleaned every few months to ensure there is no deposit of rust or corrosion from dirt and debris. Take your car regularly for service, where it will be cleaned thoroughly. However, if you have the right tools and mindset it is always a good idea to remove the sway bars and clean them separately. The sway bar is found right behind the wheel, so first, you would have to take off the wheel in order to see better. Then proceed to undo the struts from under the hood. After achieving that you are on your path to removing the sway bars. They will come off easily if you separate them from other components using a hammer. Check and make sure the sway bar and the bushings are intact and the rods are not snapped off and you do not notice any play inside them. Next, take the sway bar to a bucket full of warm water. Let it sit there for some time and then use a cloth to clean off the dirt from it. Finally, put some grease in the joints, reinstall the bushings and you are good to go. Once you have applied ample grease to all the joints, take the sway bar back to where it belonged. Reattach the struts, springs and follow up by tightening them in place. Put on the tire and wash your hands. Sway bars are easy to test, as all you have to do is drive your car. And it is not just driving the car but it is about really testing it, so you are expected to take your car to an empty parking lot where there are no other cars around. Place your hands firmly on the steering and press the throttle. Attempt a few hard turns and feel for any weaknesses through your steering wheel. If you have done a good job with the cleaning and reassembly chances are that you won’t feel any loss in handling. The next phase involves testing the car on bumps. This is necessary to check if you connected the sway bars effectively or not. If they dislodge from the suspension system after a few bumps, you can be sure you did a terrible job. Keeping in mind you did a terrible job of joining back the suspension components, it is time you visit the mechanic. Certified mechanics have vast experience in their field, so you can expect good results from them. Furthermore, you can use this chance to properly see how the suspension is disassembled and reassembled, so the next time you can save money and do a perfect job yourself. When you go for a suspension check-up, the mechanic will first look at the state of your sway bar bushings. If the bushings are worn out, there is a large chance your sway bars are loose and causing trouble for you. We have already gone through the process of repairing the sway bar, however, if you are unfortunate and break the sway bar you would need a new one. New ones can cost you $100 -$300 depending on your car. If only the bushings are being replaced the cost will lower down to $70- $100. The labor cost is pretty cheap when it comes to suspension work. So, expect nothing more than $100.